An honest cereal packed full off natural goodness, a healthy breakfast cereal. 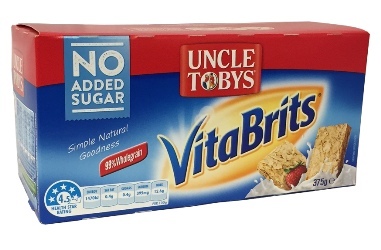 Simple, natural and tasty, Uncle Tobys VitaBrits Weeties are made from 99% wholegrain wheat, have no added sugar, are high in fibre and low in fat. Wholegrain Wheat (99%), Salt, Mineral Sea Salt (E508, E511).